Remember how we announced that a pedestrian walkway to the Arch grounds was being built in the Arch Garage? The walkway connects a ramp from Washington Avenue to stair/elevator to Arch grounds. During the five minutes I took pictures of the new walkway, over 45 people used it to get to and from the Arch grounds. This new connection helps people move more easily from the Landing or the Arch-Laclede’s Landing MetroLink Station to the Arch and the surrounding park and riverfront,especially if someone has limited mobility or is pushing a stroller. Final stages of the walkway includes additional lighting, and we are looking at bike parking options. If you are out exploring the Arch grounds this weekend and summer, don’t forget to check out the options at the Core of Discovery, the corridor of attractions along our riverfront heritage. Have a great weekend St. Louis, and safe travels. The improvements are most welcome, but people shouldn’t have to walk through a parking garage to get to the Arch. ^^^…or Laclede’s Landing, for that matter. Just like I70, the Arch garage NEEDS TO GO. I really don’t care that is considered a necessity. It’s an ugly impediment to traffic between the Arch and the Landing. Put it south of the Arch, next to I64, and create a better pathway between the Arch grounds and Choteau’s Landing. The Arch Garage Must Be Torn Down. 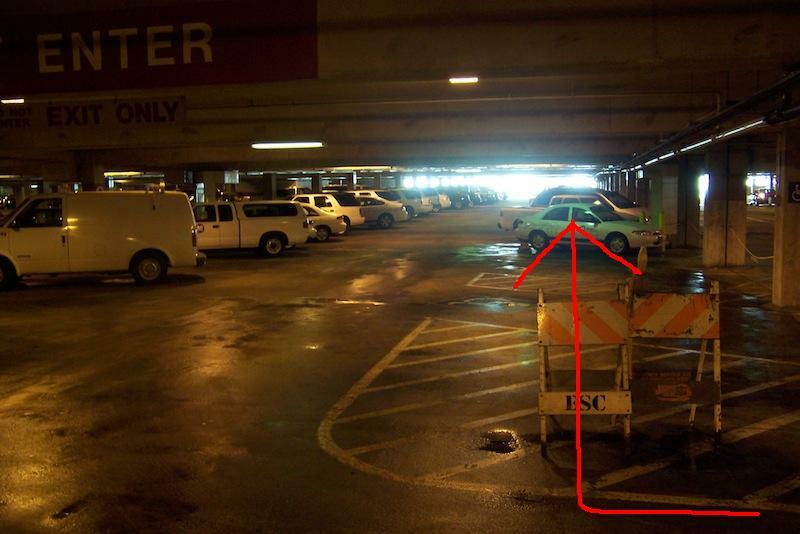 I mean, who was the idiot who thought that putting a huge parking garage there would be beneficial? Any plan for the Arch grounds which doesn’t include removing this mistake should be dropped from consideration. So you would rather have people walk around the garage to get there? We could just tear down the garage but then where will everyone park to go see the arch? 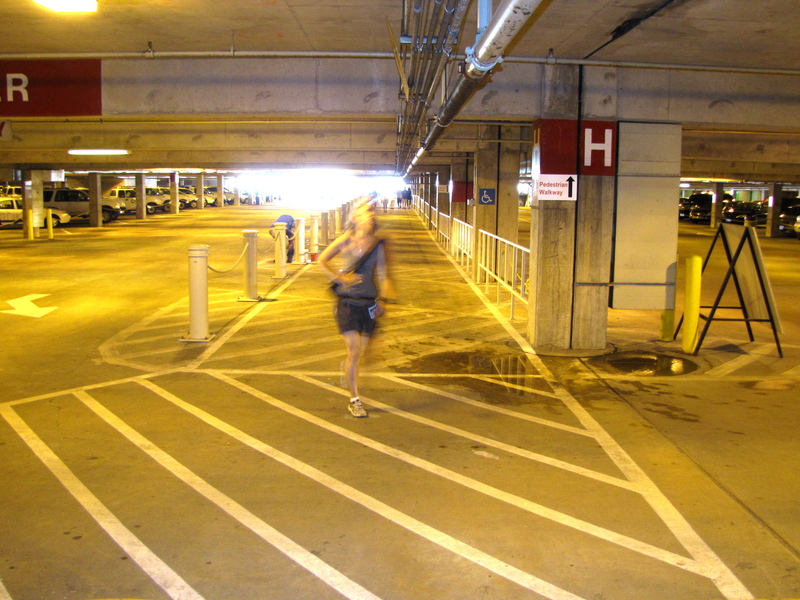 What if this walkway was also serving patrons of the landing, giving them an identified route out of the garage? Hey that’s awesome & like 100% less sketchy! This really is a case of working-around an existing problem to (kind of) offer a solution. The pedestrian walkway works – I used it to get back to the Landing on the 4th – but it is in no way inviting. Visitors don’t want to enter a garage to get to a place that is already outside. It is an add-on and you can tell when you walk along it (the existing paint from old parking spots, the quick-fix poles divider poles and chains); but there’s no better solution to a mid-grounds entry point than this as long as the garage is still there. A better fix – and I don’t imagine this is a Metro project – would be to better pedestrianize (new word?) Washington Avenue between Memorial Drive and Leonor K. For half its length, there is no sidewalk on the street’s north edge and nothing really inviting a pedestrian moving east to continue the trek to the riverfront besides, you know, the knowledge that the riverfront is there. Implement sidewalks on both sides, from the top to the bottom and dedicate the northeast surface corner of the garage to a Tourism/Visitors Center and some sort of Gift/Snack Shop combo and that section of Washington Avenue becomes worth walking. There will be no reason to provide a cut-through in the garage to a dark stairwell or a dingy elevator. Of course, there’s the issue of rising waters – as was the case for Fair St. Louis – but its an occasional issue and one that, in the future could be solved with an open-air staircase and elevator near the visitor’s center. Still, good work on Metro’s part to find a for-the-time-being workaround. Works for me, I have cut through the garage in the past but this makes it much more practical. 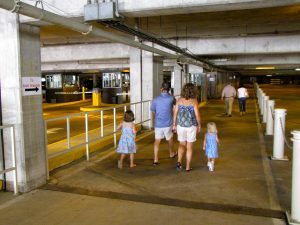 It reminds me a lot of the walkway from the Bus Port to the Main Terminal at Lambert Airport through the parking garage, or for that matter the walkway from the East Terminal MetroLink station to East Terminal at Lambert Airport. Both configurations have been in place for a number of years, and nobody seems to have a problem finding their way. Plus you are protected from the weather somewhat.